Great looking lamps. I love them!!!! Create a crisp, minimalist look with this one-light table lamp from Kichler Lighting. 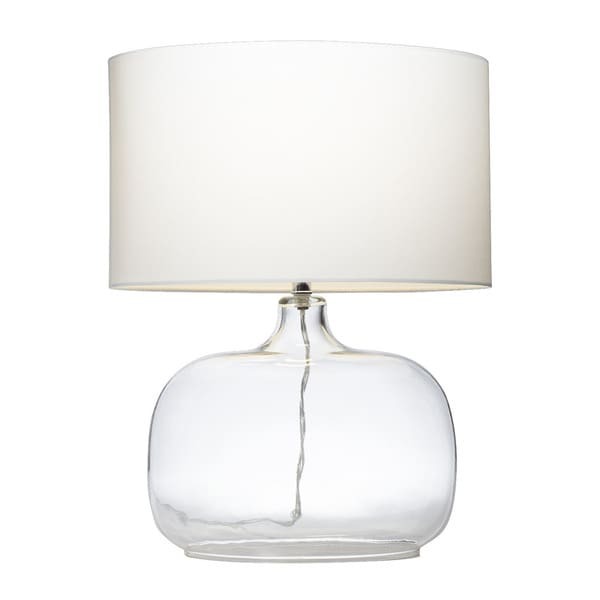 Complemented by a white linen shade, this lamp sports a clear glass body that easily coordinates with other pieces. This light is so simple and sophisticated! Love the light it provides on my landing. Love the clear look of the lamp to add light to our decor and style without being overstated and obnoxious. Would go with about any decor. Recommend. Bought this lamp along with the another lamp (same brand and design but different shape). The two together look awesome in my family room. The lamps gave really brightened up the space. Impressed with the quality of this lamp. Clear crisp looking glass. Nice white lampshade. Securely packaged. Very happy with this purchase. Looked for a clear glass lamp in various sources, but did not want to spend over $100. The clear glass lamp from Overstock was delivered in good condition, timely, and fits our sofa table perfectly. Only surprise was the "open" base. This lovely lamp may as well be four times what we paid for it. It was a great value and adds high style to a room with bamboo blinds, dark wood and patterned rugs. At different times, we've placed items inside it, since it has a cloche-like function. I want to put a plant in it next. This is one of our favorite purchases ever from Overstock. Good work. I bought 2 of these for our sofa table, they are beautiful. The white lamp shade is oval, not round, which makes them unique. I also like the fact that, because the base is clear they don't take up as much visual space as something solid. Just an FYI, the base of the lamp does not have a bottom, which doesn't affect the looks,IMO, or stability. Gorgeous lamp! Bigger than pictured. I have a small side table and it covers most of the table's surface. This lamp is eye-catching. You'll love it! I bought two of these for bedroom nightstands. The shade on one of them arrived dented in several places. I first called Kichler but they said they didn't have any matching shades in stock, so I ended up having to send the entire thing back to Overstock for a replacement. One thing I wanted to clarify is these are in fact NOT round as stated in an answer by Overstock to that question--they are very oval. So I was a little surprised by that, but I actually prefer the oval shape as they fit better on my nightstands. Overall, they look more expensive than they are and they go well with my nautical theme. Beautiful accent piece. Just what I was looking for. It worked great in my clients bedroom table. Good quality and no damages. I would buy this again. Beautiful! 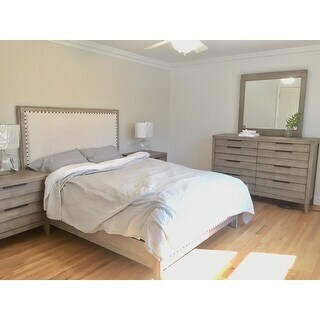 It completed vacay home bedroom interior. My client was really happy. I bought 2 and getting one more for guest bedroom. As a decorator, I look for items that can be interchanged when you redecorate. These fit the bill. Just as nice as the one I purchased from the PB store for MUCH less. Do not hesitate to order! The clear glass,I placed artificial grass inside it is simply beautiful. 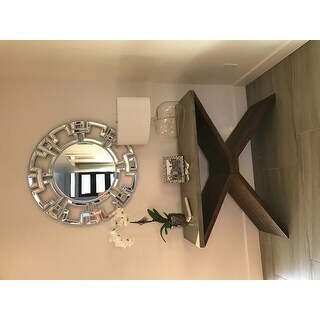 Love it’s size and it makes a statement in my foyer. I love this lamp, but unfortunately it ended up being a bit bulkier than I envisioned. Make sure to measure your space well before ordering. lampshades broke almost immediately,,, trying to sell on ***, offer up and let go! Exactly as described. Love the oval shape and it is the perfect height and size for the dresser in our guest bedroom. Puts off great light when paired with a 60w LED bulb. Overall, I really liked this lamp. It's modern and versatile, giving a clean and interesting detail to the space. My only two complaints are that: (1) the hardware on the top is chrome silver, which I did not realize from the photo, and (2) the shade did not sit perfectly even. Despite those things, I would have kept it but my husband did not like it, so we are returning. I needed a lamp that would not detract from the rest of the look that I was aiming for in my living room makeover. This beauty was just as pictured and it did not disappoint. I wish the finial was satin nickel and not chrome, but this wan't a deal breaker. I didn't notice the finish in the description when I bought them, so that's my fault. These are still nice looking in my master bedroom. They seem like decent quality. I wish these were just a little taller! Great statement lamps in our entry with a big bright piece of artwork but they are a little underwhelming in size! The lamp is elegant and works well in my sunroom. The glass is sturdy and a lovely shape. Importantly, the bottom of the base is open, so it won't attract and trap little bugs like the lamp I'm replacing. I've had previous positive experience with the Kichler brand. "The listed height is 22". Is that with or without the lamp shade?" The 22-inch height is with the shade attached. "I are the base and shade pval shaped?" The base of the fixture is round. "Would someone please be able to describe what the finial looks like? Wish there was a pic of this. Thx!" The bottom finial is a round ball. "I want to confirm if the glass is clear or does it have bubbles in it? Or seeded glsss. Thank you "
It's clear - and it's gorgeous! The shape is really different from a lot of glass lamps (oblong rather than round). I absolutely love this lamp. "Is the bottom of this lamp closed? I looked at a similar item and the base of the lamp was open"
It's open so it is easy to put things inside. But once u do, u have to leave it where it is bc if u move the lamp, the items inside will shift out our around. I put pink feathers for my daughter'S room. It is open - it's a beautiful lamp, I love it. It is open... Perfect for putting sea shells and other beach related items. In my opinion it lends itself to that beach dÃ©cor because of the clear base resembling water like bubbles also looks best on white furniture than darker furniture. "Is the lamp shade white, or off-white in color?" "Is this lamp French wired?"